Did you miss the meeting? Here’s the audio from our broadcast. You are cordially invited to our 7th annual meeting — broadcast on the air and online — on Wednesday, December 19th, from 6:30 PM to 8 PM. We will announce the results from our board election, as well as present reports on KCAW’s finances, programming, and more. This evening will be hosted by Becky Meiers, Raven Radio’s General Manager. You are encouraged to participate in your community radio station! If you are a member, please make sure to submit your ballot for the board election by Tuesday, December 18th, at 5 PM. Listener comments are welcome — we will open phone lines for comments as we wrap up staff reports. Call (907) 747-5878 when prompted! 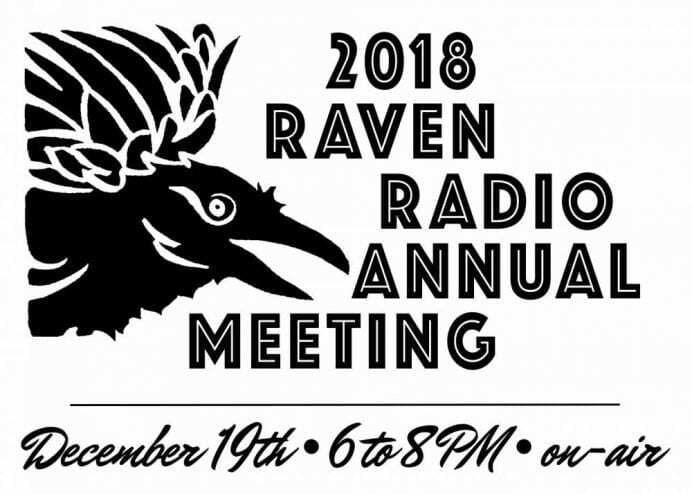 Here is the Raven Radio On-Air Annual Meeting Outline 2018. Thank you for joining us, Raven Radio community!